I Forgot to Add Express Tools to AutoCAD! Now What? One thing that can easily happen when installing any version or flavor of AutoCAD is to forget to install the Express Tools. It's easy to miss them, but if they need to be added after installation, it's not hard at all. Here's the steps to do it! 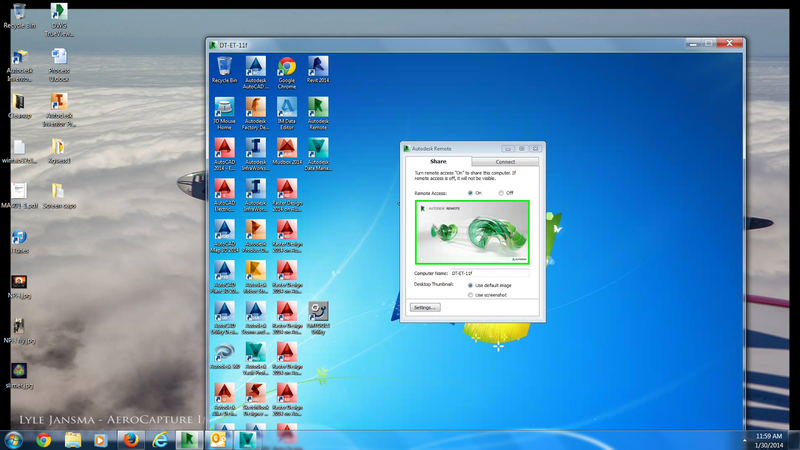 The first thing to do, is locate Add/Remove Programs in the Windows Control Panel. 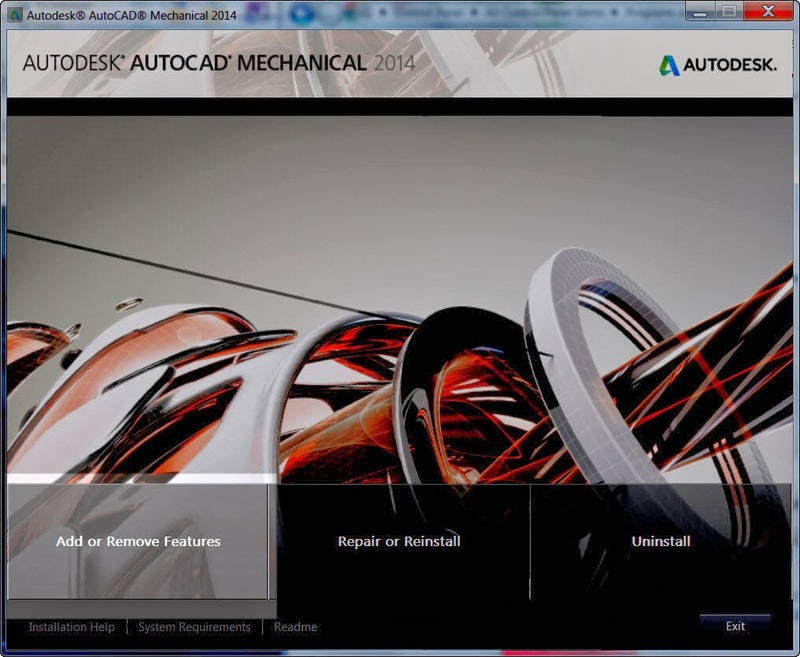 Find AutoCAD, and right click on it. Choosing Uninstall/Change. 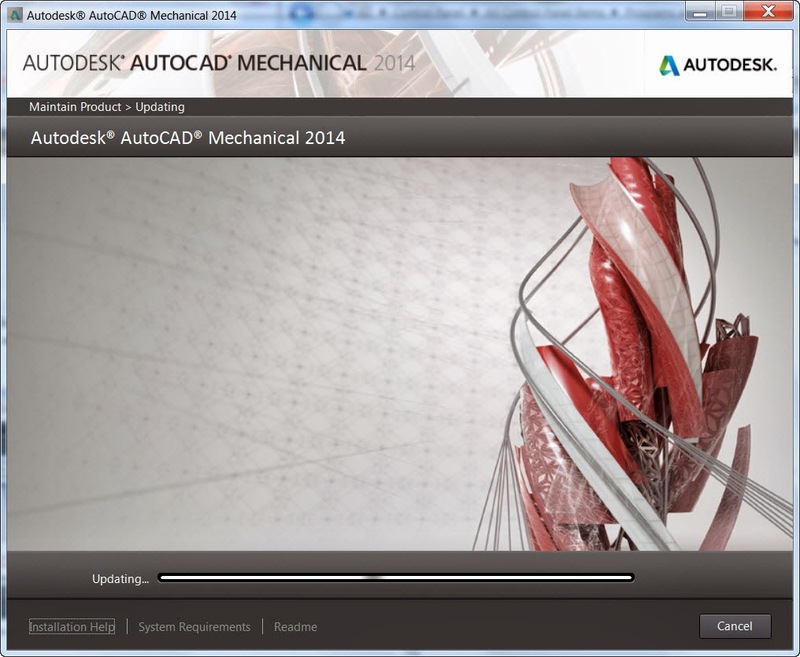 I'm using AutoCAD Mechanical 2014. Keep in mind you may have a different version or flavor of AutoCAD! AutoCAD's installer will start. Choose Add or Remove Features on the first screen that appears. 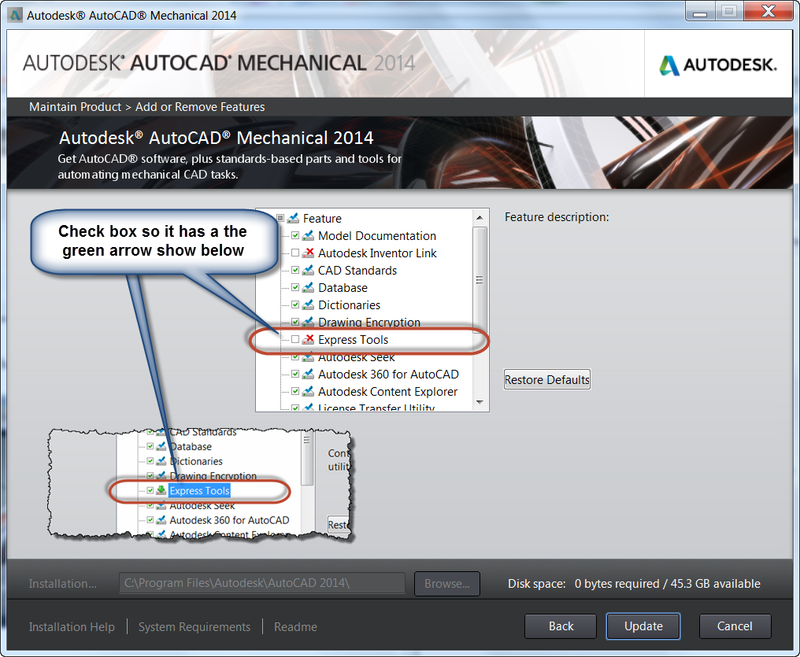 Choose "Add or Remove Features"
Click through the screens until a list of AutoCAD Features appears. If Express tools has a red 'X' on it, check the box so it has a green arrow like in the image below. Once Express Tools is selected, click Update. Make sure to select Express Tools and choose update. AutoCAD will update. Let it run, finishing when it completes. 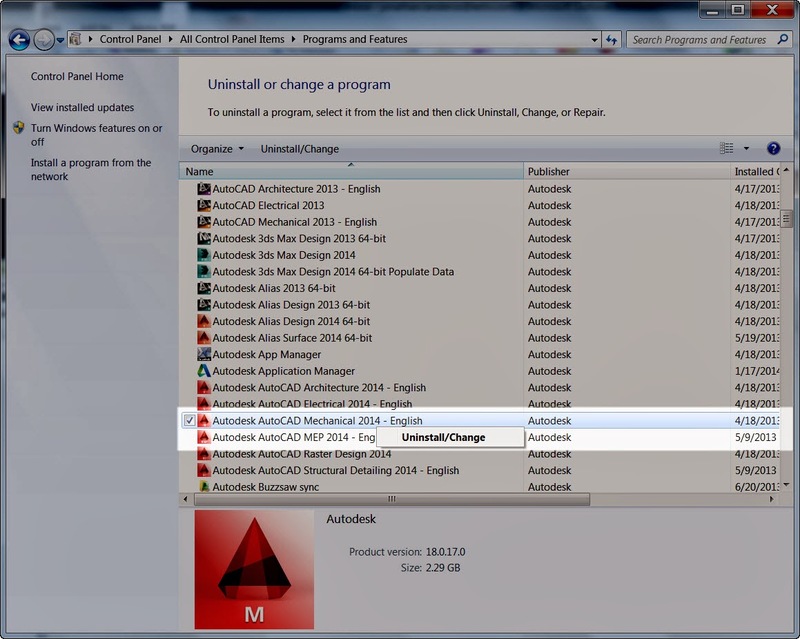 Once the update is complete close the installation dialogs and start AutoCAD. If the Express Tools don't load, there may be one more step that has to be done. But bear in mind that the location can vary slightly with different versions of AutoCAD, and system configurations. Click Open to close the first dialog box. Choose , followed by Close to load the *.cuix file and then close to dismiss it. 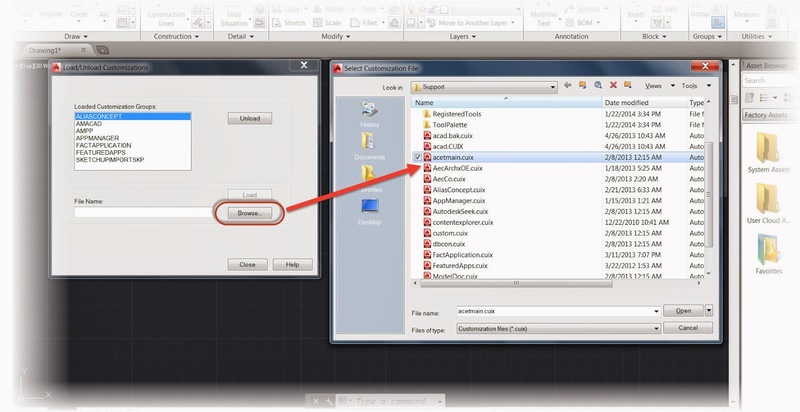 After these steps are done, the Express tab should appear in your AutoCAD installation, and you're ready to go! Ta Da! There it is! And for a video showing the above procedures, take a look below! Just yesterday, I used this very technique to add Express Tools to a users machine. And while all the toolbars were added successfully, I received a "Unknown Command" warning when trying to execute one of the Express Tools functions. The steps I used was to type OPTIONS, and on the files tab, choose the Browse button. 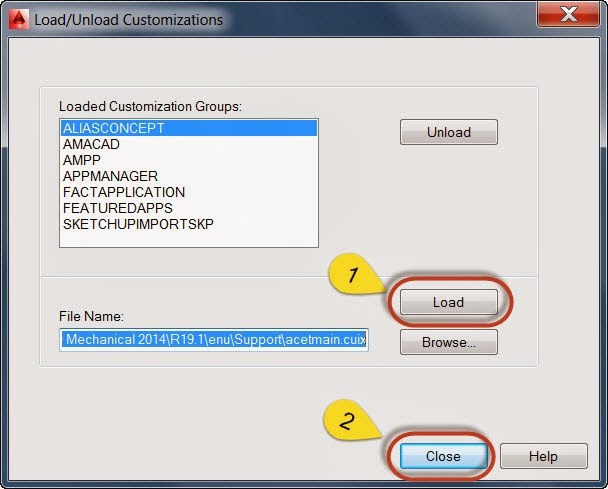 Navigate to the following directory \Program Files\Autodesk\AutoCAD 20XX\Express, and choose the Add button to add the path to the support directory. Once I had done that, the Express tools were working just fine! 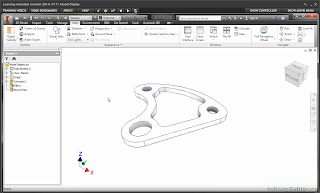 One of the new functions in Autodesk Inventor 2014 is creating a drawing view as a raster view, and allowing the user to make it precise at the time of their choosing. For starters, what's the point of starting a view as a raster image, then making it precise later. Simply put, it lets the user to defer the full calculation of drawing views until later. Imagine this on a large drawing view with a lot of calculations involved. Now extend that across multiple projected views. It can take quite a while! 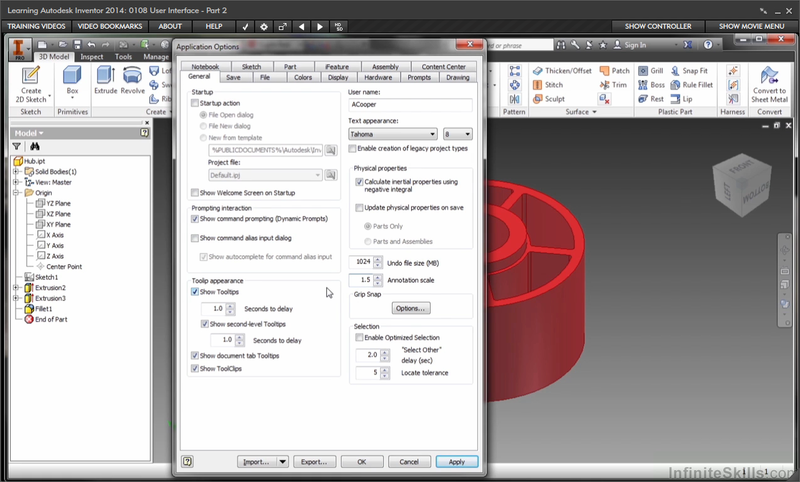 Placing the views as raster views lets the user quickly place the views initially, then choose which views to make precise when needed. The "hit" on calculation can be spread out over time. Make one view precise, and work on it? Going to a meeting? Calculate another view while you're gone! Going to lunch? Make another view precise, and so on! So that's the purpose of it! Now, how does it work. When creating a base view on a drawing sheet, there's a check box to Raster Views Only. With this check box selected, the views will be placed quickly. Aside from selecting that check box, placing views is the same. Once the views are placed, there will be green brackets around the views that are being represented as raster views. At some point, however, it will become necessary to make the views precise. To do that, right click on the view, and choose Make View Precise. Calculating the views into precise views. The green brackets will disappear, and the view is now precise. One view is precise now. The others can be calculated later, when needed. Other views can be made precise later, when they're needed. The views don't have to be calculated at once! And for a video description of the steps! Take a look below! 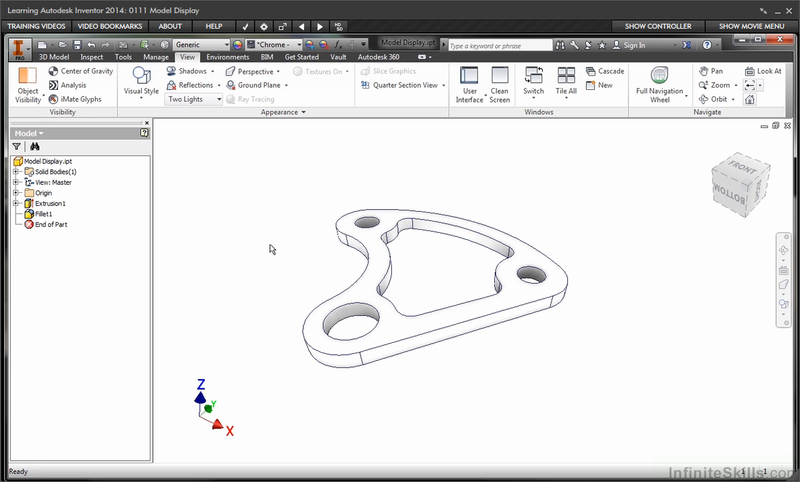 And for even more information on this tool, take a look at the Autodesk Online help video at the link here! As an artist, I've always wanted to participate in the dialogue of art with other artists. I've always considered assembly level features a bit of a specialty tool in Autodesk Inventor. That doesn't mean I don't think it's a valuable tool. It just means that it seems like there are users who really use it, and there are users who never touch it, with very little middle ground. When I'm playing around with wood working projects, I use it a lot. 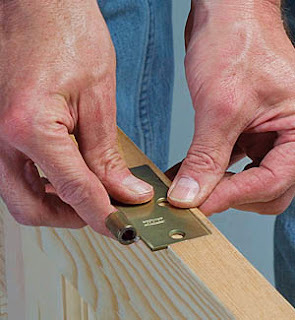 It's perfect for creating things like dowel holes and hinge slots. 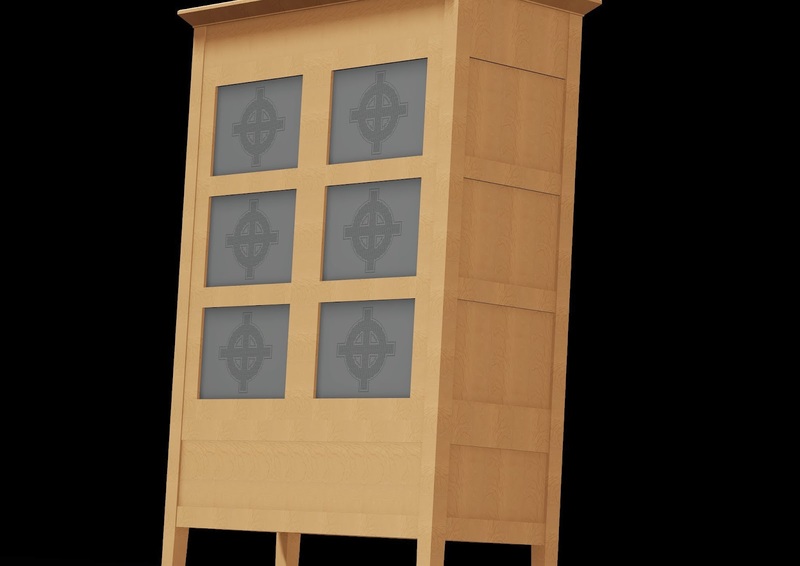 These features are typically creating in components that are already assembled together in wood working. 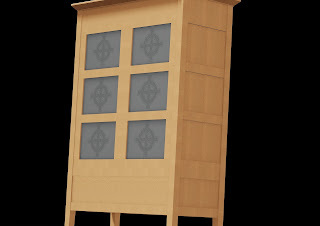 Today, I was slowly building a Pie Safe in Inventor from plans I found in a Fine Woodworking article, and the time came to add the hinges to the doors. 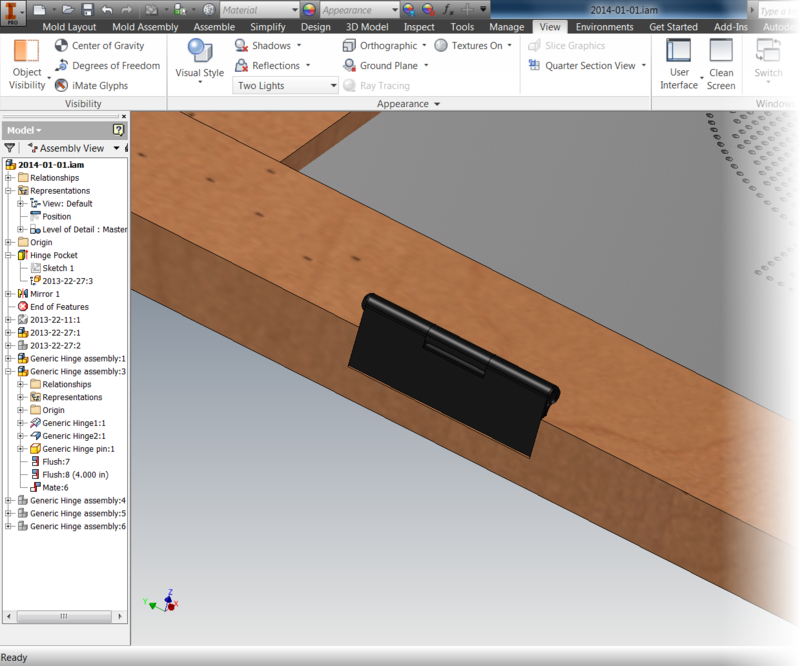 The hinges need to have clearance cut for them, which is pretty common, even expected. Since the door would be assembled by this point in the construction, I reached for my assembly feature, created my sketch, and extruded my cut. And something happened I had forgotten about. Inventor cut the slot alright! But it cut right through the hinge too! The assembly feature cut everything in it's way! Doh! That's not what I wanted! At first glance, one might think that this tool isn't very helpful if it's going to blindly cut everything that gets in it's way. 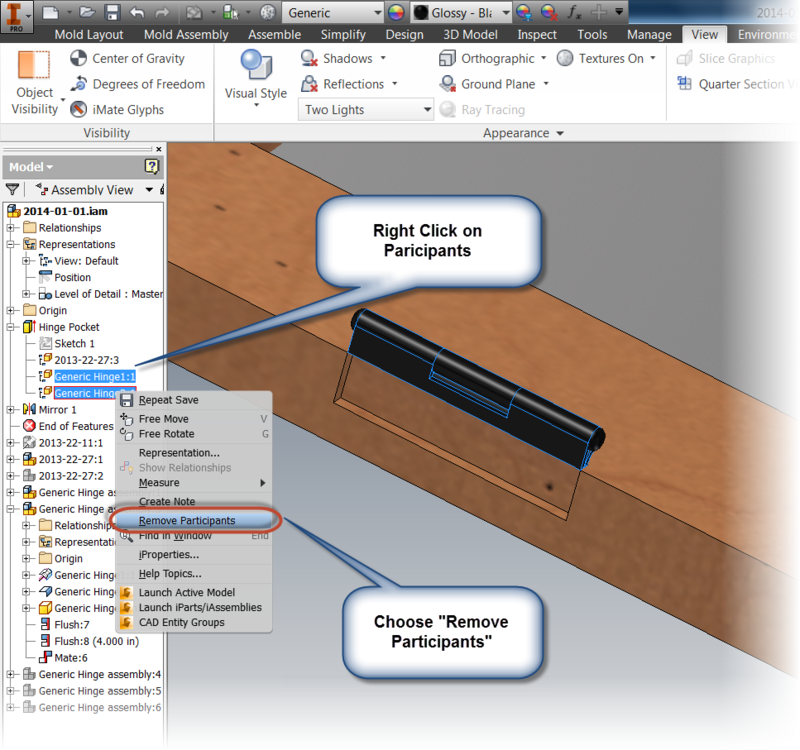 But Inventor does give us the ability to control what the assembly feature cuts. All that's needed are a couple of clicks. The first thing I need to do, is locate the assembly feature in the browser. 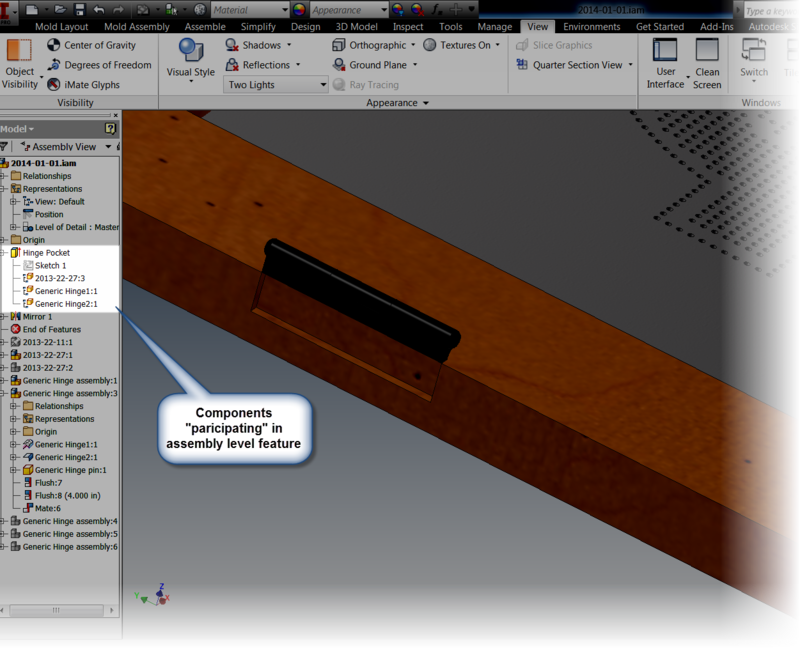 Expand it, and a list of the components that are "participating" in the extrusion appear. In this case, it's the component making up the edge of the door (2013-22-27:3) and the two hinge leaves (Generic Hinge1:1 & Generic Hinge2:1). 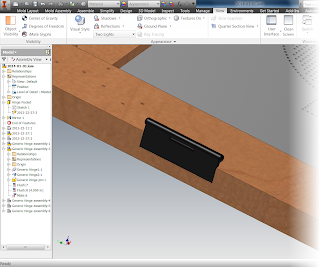 What I really need to do is tell Inventor not to have the hinge leaves participate in the extrusion! I do that by selecting each hinge leaf, and choosing "Remove Participant". Once the hinge leaves are removed from the feature. Everything looks as it should! My design intent is truly captured! So that's how to tell Inventor not to include components in an assembly level cut. If you're using this tool, I think this could be an important aspect that could get easily overlooked. And as one last tip, what if a component needs to be added to the assembly level feature, that is told that it needs to participate? If that's the case, right click on the feature, choose "Add Participant" and select the components you wish to add. Give it a try! And for a video on the steps I showed above, take a look below! 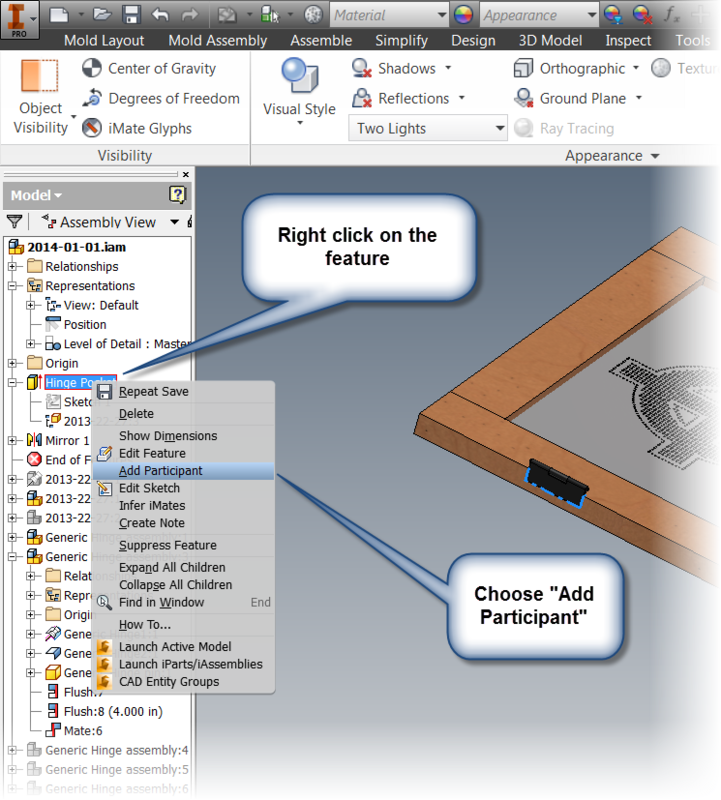 And one final note, more information on the assembly level feature can be found in the Inventor help system here! 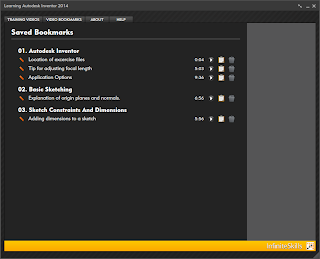 A Review - A Look at Infinite Skills "Learning Autodesk Inventor 2014"
Back near the end of 2013, I was asked to review Learning Autodesk Inventor 2014 video based training created by Infinite Skills. So I took some time, dove deep. I wanted to not just take an overview. I wanted to dig into it and really understand it. Before starting anything, I think it's important I say that I didn't get compensated in any way for this. I was just given a link to download the files, and then the freedom to take a look at the files. Beyond being supplied training files, I was free to formulate my own opinions. With that out of the way, I'd like to start out with how I see video training. Personally, I'm a big fan of video based training. I've created several videos myself, and I use them whenever possible. However, having instructed several courses myself, I've always thought that they couldn't replace class based training. I've just thought it's too hard to replace the interaction, and experience of live instructor. I guess you can say I'm a little biased that way. But it's time to set my biases aside and take a good look. The first thing I did, was take some time to get used to navigating the viewer. I found that it's easy to get used to and simple to use. There was also a pretty good help system if I had a question on the navigation. The videos are organized into fairly short segments, most of them a few minutes long. I thought this made it easy to take them in small increments and avoid getting overwhelmed. Plunging into the videos, starting with Inventor's interface, I found the instructor, Adam Cooper, to be easy to listen to. He wasn't monotone, but he wasn't "over the top" trying to be entertaining. He was the right amount of giving the information in a engaging, and interesting way. An example of the lessons on screen. I also noticed that he pointed out things that he did out of his preference. Not because it was a "better" way to use Inventor. Just that he liked a setting, or this approach, and why he does it. It shows his experience, and an understanding that there are many approaches that work, and each user can choose which they like at their discretion. I also quickly noticed was the depth of information that was included in the videos. Far more information that I felt I could give in a lecture. That level of information would be too overwhelming in a lecture format. The nature of having the lessons in a video format, with the ability to bookmark them, made for a much easier mechanism to take in the information being provided. Which brings me to what I found to be another useful feature. 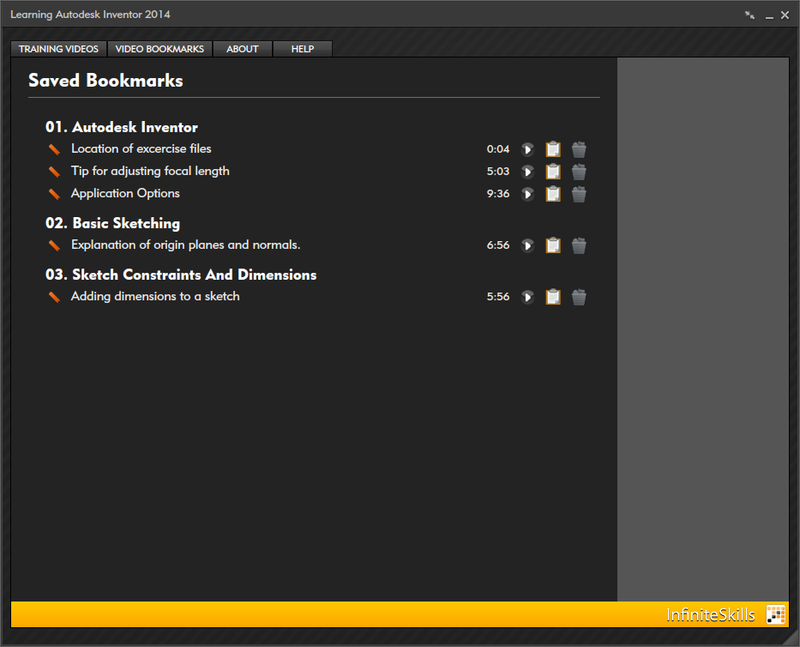 The bookmarks. At any point a video can be bookmarked so it can be returned to at a later time. So if a subject of particular interest is found, it can be bookmarked, complete with a title and description, for later reference. The bookmark page. VERY useful! While my overall impressions were very good, nothing is perfect. And while I won't say there's something "bad", there are some things that I wish were better. And this one is a pet peeve of mine, pure and simple. Every once in a while, the key strokes came through on the video. While the information is all good, and it in no way impacts the quality of the information, I would have been a happier not hearing them. Granted, I was using a headset with the videos, which makes the keystrokes more prominent. Yes. It's a minor thing. But as I said, a peeve of mine. I like the Infinite Skills Inventor 2014 videos. I think they're an excellent learning resource for someone looking for some self paced learning, at home, or on the job. 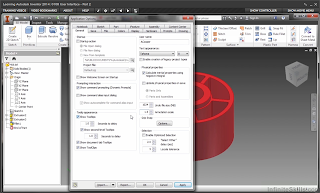 The videos are well structured and have all the information needed to provide someone a solid foundation using Autodesk Inventor. The amount of information provided is very thorough. I like that. I like the ability to see the different settings and approaches for tools in Inventor. Being someone who likes to see the options and choose one I like the best, I like the depth of information that was provided. At the price point of $99.95 USD, the investment isn't going to "break the bank", especially when compared to the time lost and frustration of the "hunting and pecking" method of learning software. Money spent on good training will save time when the software is used "in the wild". My ultimate conclusion? I think this is an outstanding learning resource! Over a year ago, I created a "poor man's" Autodesk Vault backup scheme using my Dropbox account. In short, my Vault Data is backed up to a folder that syncs to my Dropbox account, creating a simple cloud backup. Information on how I did that are found in my post here. I've been using it for a year, and it's worked great. I've never had a problem with it. First, this wasn't a problem with the scripts, my internet connection, or Dropbox. Each one of these tools worked flawlessly. It was the user (that's me!) who screwed this up! So what did the user do? I had to restore a different Vault Database and Filestore for a customer test. I ran the backup, which actually failed because I didn't have enough disk space. But that, is a separate issue. The rub? I neglected to make sure I had a safe backup of my own Vault data in a safe place. And my cloud Vault backup was destroyed. Had I really just effectively killed all my personal Vault data? Thankfully, no. Lucky for me, Dropbox has a way to restore lost data. First, browse to the folder where the data was, and choose "Show Deleted Files"
A list of the deleted files will be displayed. Now right click on the files to be restored, and choose "Restore"! Now the files are resurrected, and all is good again! Needless to say, that backup is now residing in a safe, safe place! For the full instructions on recovering a file deleted from Dropbox, check out their help at the link HERE! There's more than one way to do it!